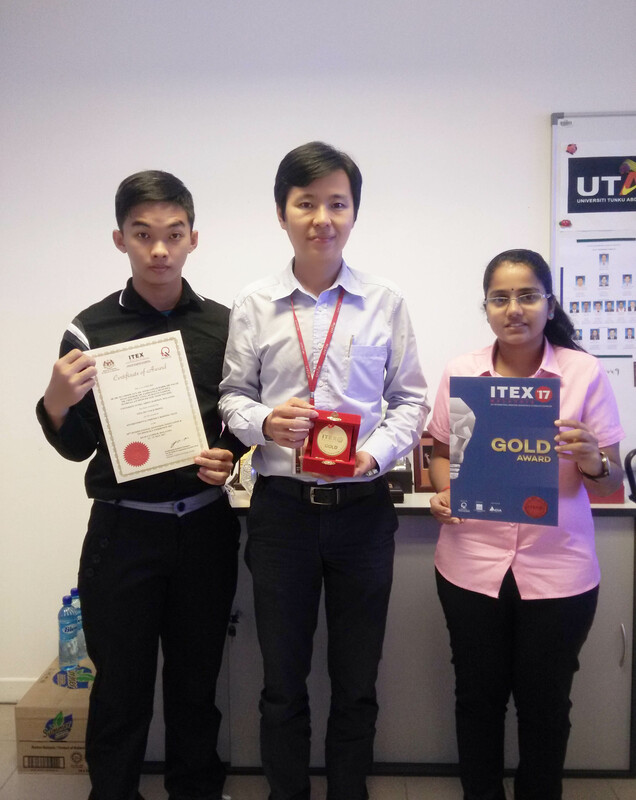 A team of eight researchers from UTAR’s Faculty of Engineering and Green Technology (FEGT) and Faculty of Science (FSc); and other local and overseas collaborative institutions, namely Universiti Teknologi Petronas (UTP) Malaysia, Heriot-Watt University of Dubai, and the Kuwait Institute of Scientific Research won gold in the 28th International Invention, Innovation and Technology Exhibition (ITEX) 2017 held at the Kuala Lumpur Convention Centre from 11 to 13 May 2017. The annual event returned for the 28th year, with the aim to bridge gaps between scientific innovation and the society, as well as driving commercialisation of creative inventions and innovations. Themed ‘Inventing for a Better World’, the three-day exhibition attracted participation from 24 countries and over 1,000 inventions by researchers from higher learning institutions as well as individuals, corporate companies and aspiring young inventors. ITEX 2017 attracted participants and visitors from countries, including Indonesia, Taiwan, South Korea, Saudi Arabia, Iran, Thailand, Poland, Egypt, Kuwait and Bahrain. The exhibition is also one the largest annual invention exhibitions in the world which featured more than 20 invention categories related to innovation and technology. The exhibition which focused on cultivating the ability to think critically served as a platform for universities, research institutions, corporations, and individuals to showcase their inventions to prospective investors for commercialisation. 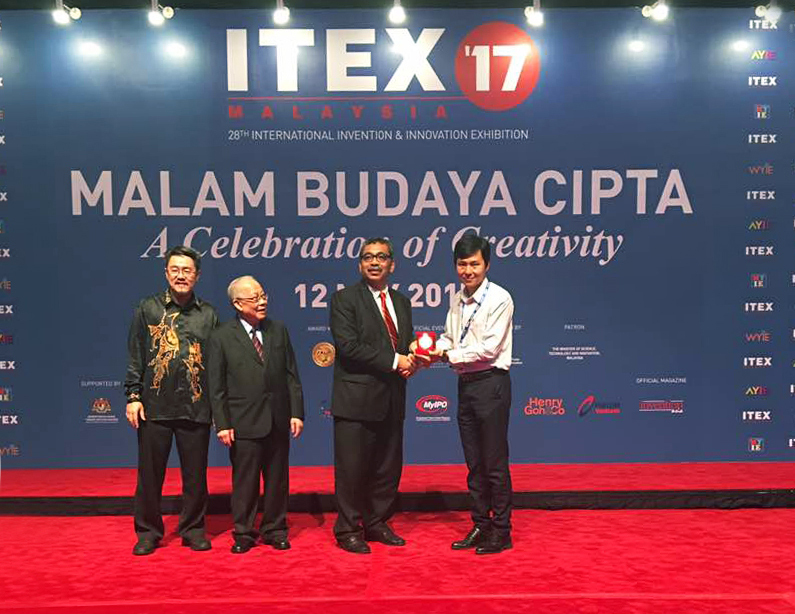 Launched by Deputy Minister of Science, Technology and Innovation Datuk Wira Dr Abu Bakar bin Mohamad Diah, ITEX 2017 was organised by the Malaysian Invention and Design Society (MINDS) and supported by the Ministry of Science, Technology and Innovation (MOSTI). Also present at the launching ceremony were MINDS President and ITEX Organising Committee Chairman Tan Sri Augustine S.H. Ong and Honorary Secretary of MINDS Executive Committee Myocho Kan. The UTAR team comprised of team leader FEGT Deputy Dean for Academic Development and Undergraduate Programmes Ir Dr Ng Choon Aun, UTAR Faculty of Science Lecturer Dr Chee Swee Yong, FEGT Master of Engineering Science students Humayun Nadeem, S. Suubitaa and Teoh Wei Ping. The team also comprised of three external researchers, namely the Principal Investigator Dr Noor Zainab Habib from Heriot-Watt University of Dubai, Dr Salah Elias Zoorob from Kuwait Institute of Scientific Research and Dr Zahiraniza Mustaffa from UTP. They submitted their invention titled “Environmental Friendly Roofing Tiles” and won a gold prize. Their winning entry demonstrated an investigative study of utilising used engine oil and vegetable oil as well as fly ash and sand as a binder for the production of environmental friendly E-Vege roofing tiles. “It’s an invention that does not require the use of any form of cementitious and pozzolanic substances. E-Vege roofing products are made from recycled waste materials which indirectly help the society to divert waste and reduce the need to extract and process raw materials. This process lowers the energy consumption and reduces pollution,” said Dr Ng.